Explore the world behind the smash-hit video game from the makers of MORTAL KOMBAT in INJUSTICE: GODS AMONG US: YEAR THREE. John Constantine, Dr. Fate, the Swamp Thing and others join the fight to control the magical havoc that is being unleashed. Now the war isn’t just for Earth, but for the very nature of reality itself! New series writer Brian Buccellato (FLASH) is joined by artists Bruno Redondo (HUMAN TARGET) and Mike S. Miller (BATMAN: ARKHAM UNHINGED) to deliver some shocking changes to this twisted take on the DC Universe! 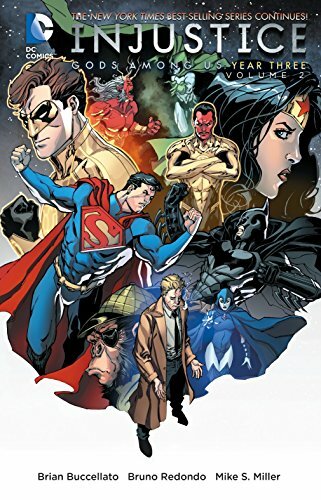 Collecting INJUSTICE: GODS AMONG US: YEAR THREE #8-12 and INJUSTICE: GODS AMONG US: YEAR THREE ANNUAL #1.